There's a bit of a story behind this outfit. My kinship, Rangers of the West, hosts what we call Open Group twice a week--once on Friday evenings and once on Sunday afternoons (server time, at least from my perspective) when we are the most active. Basically, this is when we encourage players of all classes and levels to speak up if they need certain content run. Sometimes we have several groups running at once and we try to keep them all within a certain level range to avoid facerolling the content. There was a reason why I didn't post this sooner. I had a full post written, pictures included, back in late October for this outfit. I was about to schedule it when I noticed a glaring error. In the original, I had used the Elegant Short-sleeved Dress, which had big poofy shoulders that clipped through and obscured most of the Mantle of the Farmer's Table. I found that to be absolutely unacceptable. I searched high and low for that dress' counterpart, the Elegant Long-sleeved Dress. I scoured the auction house. I tore apart my housing chests and storage alts. No luck. 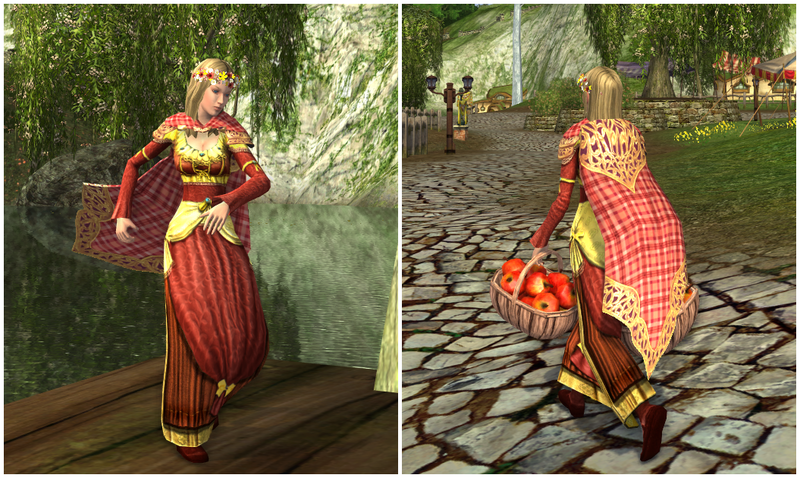 When I googled the dress, I learned it was a recipe reward from the Spring Festival red flower boxes...that supposedly no longer existed due to loot table changes. I could have stuck with the short-sleeved version and swapped out the mantle. But that meant the cloak had to go too. For the first time, I'd been able to incorporate the Farmer's Table cosmetics into an outfit and I absolutely refused to swap out those two pieces! It was then I turned to trade and world chat, hoping to find help. Nobody had the recipe. A few people said that recipe hadn't dropped for several years. 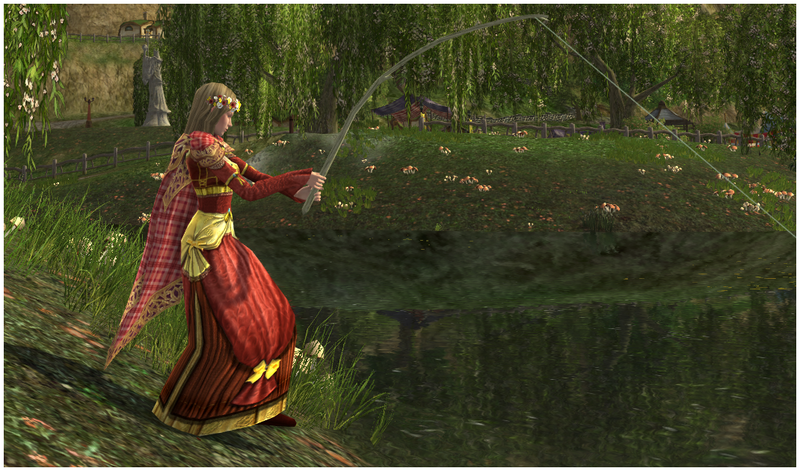 I even started asking on Twitter in various LOTRO groups/lists. Five months of asking around and I managed to find a long-term player that knew it! Even though that person didn't ask for anything in return, other than the materials to make it, I tipped 25g as a thank you. Now I take this outfit wherever I go on my Champion. I have no qualms running through the ruins of Barad-dûr, swinging away with apples that magically never seem to fall from the basket. One of my loving kinnies calls me the Two-tote Terror because of that. And it makes me giggle whenever I buy a bag of apples at the local supermarket. 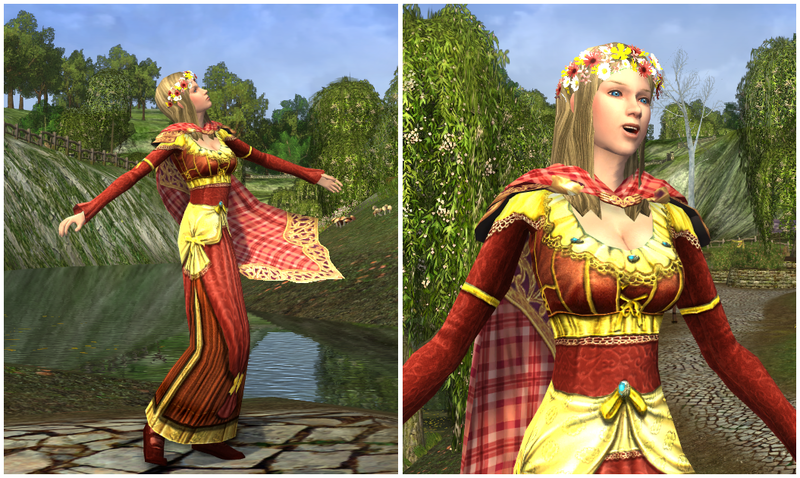 **According to the LOTRO-wiki, the recipe for this dress no longer exists. But if it does indeed still drop from the Red Flower Gift Box, please update that page. 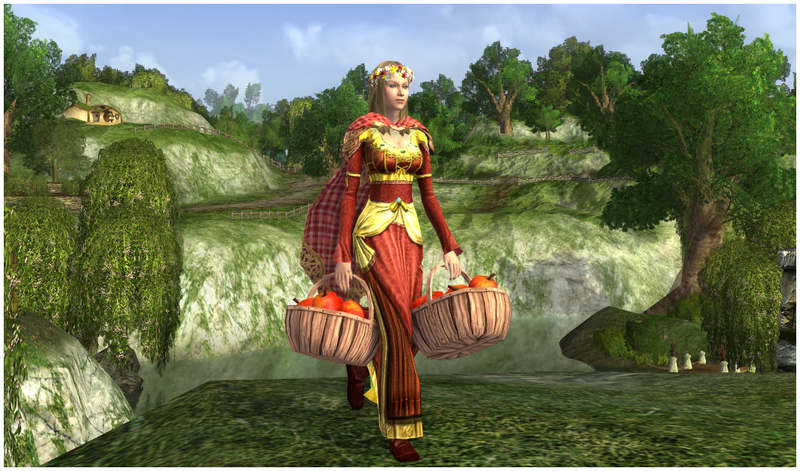 Congratulations with getting in LOTRO beacon! You deserved it with such amazing collection of outfits! Good work! Thank you! I wasn't expecting to be featured again the Beacon. It was quite the surprise!